The MotoGP world championship row between Valentino Rossi and Marc Marquez has "poisoned" motorcycling, the president of the sport has said. Championship leader Rossi clashed with defending champion Marquez, who came off off his bike at the Malaysian Grand Prix on Sunday. Rossi, 36, later accused Marquez of "making me lose the championship". 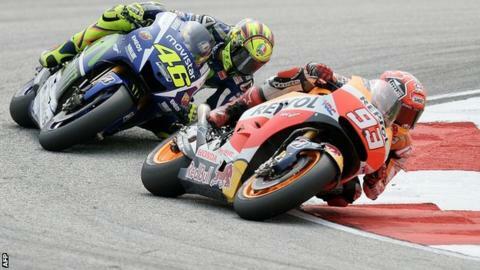 Vito Ippolito, president of the International Motorcycling Federation (FIM), said the feud was "damaging". "The recent events arising in connection with the competition for the 2015 world title have had a damaging effect on the staging of our competitions and poisoned the atmosphere around the sport," Ippolito wrote in an open letter. "We are moving away from the tradition of pride in sportsmanship that is part of the heritage of motorcycling." Rossi finished third in Sunday's race - won by Dani Pedrosa - but was given three penalty points following a post-race investigation. He will start the final race of the season in Spain on 8 November from the back of the grid, with Jorge Lorenzo just seven points behind in the championship. Before the race in Malaysia, Rossi accused Marquez of deliberately trying to impede him during the Australian Grand Prix on 18 October in order to help Lorenzo.